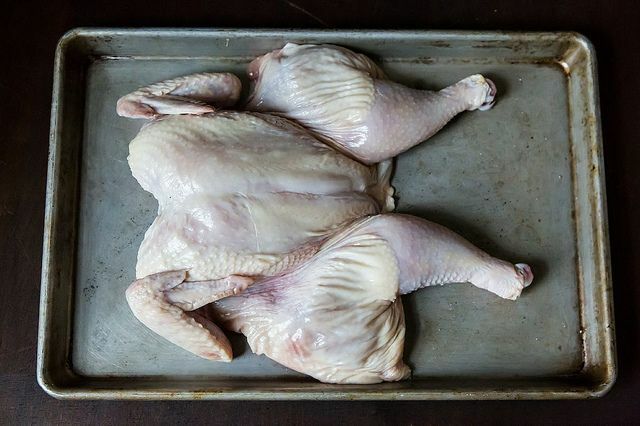 Today, we're showing you how to spatchcock (a.k.a. butterfly) any bird for quicker, more even cooking. "Spatchcocking" is just the fun way to tell people you're butterflying a bird, by taking out its backbone. Why would you do such a thing? Well, it's much easier than it may sound, and your chickens and turkeys will cook quickly and evenly -- cutting the time almost in half. Here's how you do it. 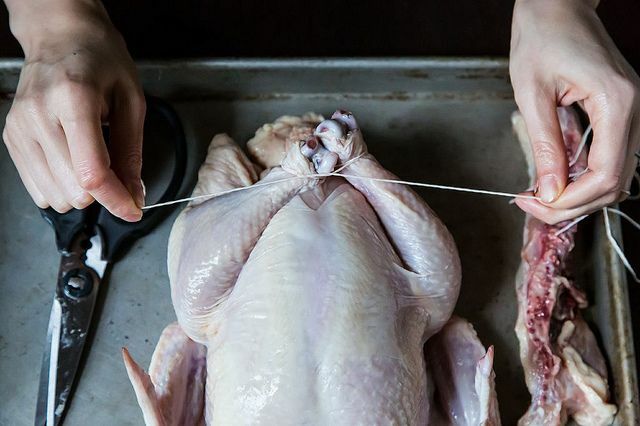 All you need are some strong kitchen shears and your bird -- this guy's a chicken, but, with a little practice, turkey works too. 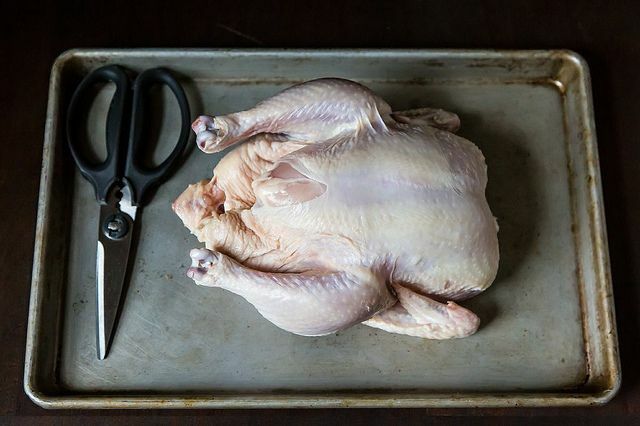 You can do this with a sturdy boning knife or chef's knife too, but scissors make for very easy navigation. Start by snipping down along the spine (most people think of this as the underside of the bird). You can start from the tail or neck end, whichever is more comfortable. Now snip down along the other side of the spine. Stay close, lest you lose any delicious thigh meat. Now you have a spineless bird. Keep that spine for stock, or throw it in the roasting pan with the chicken for extra drippings and some good meaty bits to nibble on. 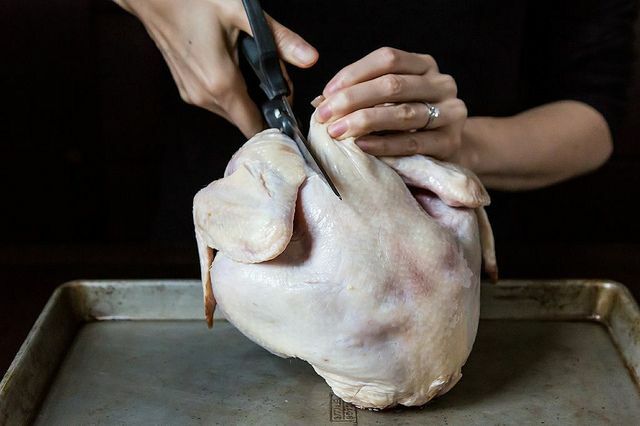 At this point, Amanda likes to truss it back together and roast it normally -- it'll still cook faster than a whole chicken, and it's a little easier to carve. For a lazy truss: tie off the ankles first. Then tie the breast and wings up. Now you can roast as you normally would (just check it for doneness sooner) -- it looks like a chicken again, doesn't it? 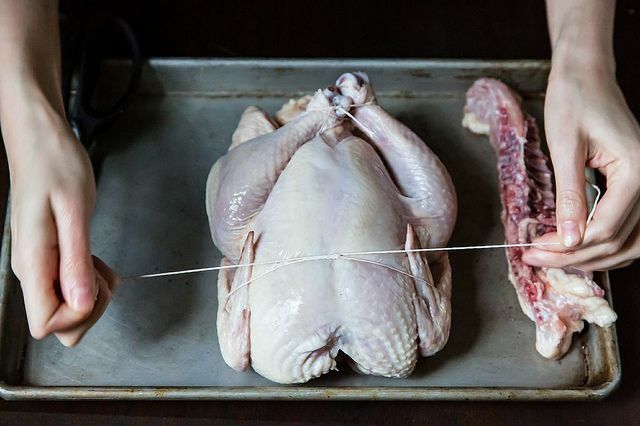 Or, if you want to go for the full spatchcock, and even speedier cooking, skip the trussing and simply lay it flat. Push the breast down until you hear a pop -- this is the breastbone giving way. 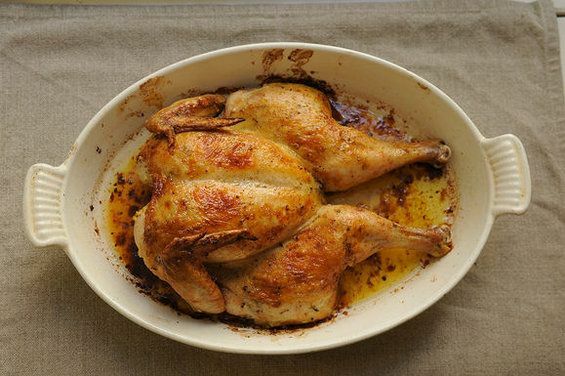 A flattened chicken is a quick-cooking chicken. Now, you can roast it, braise-roast it, or even grill it, in about half the time. Or you can tackle turkey next, for a swifter Thanksgiving meal. Would just note here that for a turkey, you really do need to cut the "keel" bone (aptly named) -- the bone running down the center of the breast inside. A good butcher will remove it altogether. Just carefully snipping through the cartilage on one side should be sufficient if you're doing this yourself. How does spatchcocking help with the fact that breasts and legs just have different temperatures of doneness? Legs still need a few degrees more than breasts. 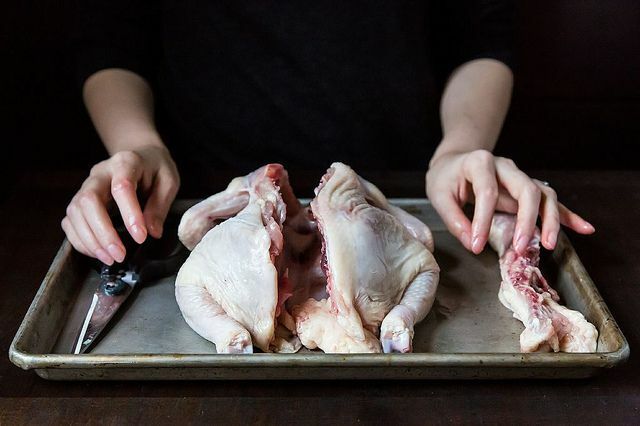 By freeing the thighs and legs from being tucked up next to the bird, the heat can get to them more easily and they cook more quickly. I have been having the butcher 'butterfly' my chicken for several years. Great for chicken under a brick. I love the term spatchcock! Great idea to tuck away for next time I roast a chicken (sister-in-law's turn to do the turkey this year). This is the same prep for my absolute favorite technique for cooking chicken...Pollo Al Mattone..."Chicken under a Brick". A turkey may be too large to fit in a pan on the stove but the chicken is sublime!!!! It's my favorite way to cook a chicken! The meat gets cooked through more evenly and it cuts cooking time- I love! I agree. I had to really whack the one I did with my cast iron frying pan before it broke! Now I just take the easy way out and have my butcher do it for me. You have never done CPR I am guessing. Find your local paramedic, they fix that. I actually debone my Thanksgiving Turkey and fill it with stuffing and tie it up. Easy to slice and all the meat has seasoning and all the stuffing has flavor too.